5.0 out of 5 starsThe Steve Jobs of Mining Companies. Robert Friedland is the Steve Jobs of junior mining companies. As it turns out, they knew each other, if briefly. Anyone who aspires to high level business negotiations in any industry would be well served to read this book. You may never be "that guy" and I frankly hope you never do, but you probably sit across the table from someone like him all the time. In counterpoint to "A. Reader" (the only 4-star review so far) the book did not start out slow to my eye. Author Jacquie McNish can tell a true story so that it reads like fast-paced fiction. She did a masterful job of research and reporting, then wrapped the whole thing into an amazingly difficult to put down book. If you have interest in penny stocks, mining, or business negotiations, you owe it to yourself to read this one. Very well written. Interesting story of a major nickel discovery and the corporate battle to own it. I was amazed that though the subject could have been very dull, this book was a real page turner. There are very few non-fiction books that can actually grab and keep my attention as this one did. An interesting book and extremely well written. 5.0 out of 5 starsInsight into Robert Friedland. You will hear from him again if you invest in Natural Resources. 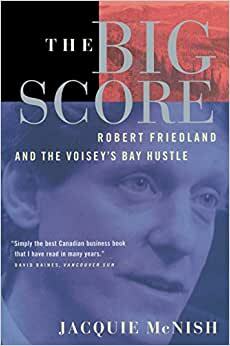 "The Big Score" is a great read. Lots of detail. Amazing amount of research with the actual people that were there at the time. I highly recommend this book as being very informative and helpful.